On Thursday 13th December we were delighted to visit Glasnevin Cemetery Museum in Dublin, to award certificates to pupils from across the Island of Ireland who have taken part in commemorating the First World War through the Never Such Innocence poetry, art, and song competition. The largest cemetery in Ireland, where many significant figures of Irish history are buried, provided a poignant setting to mark the centenary and also to look to the future. Children travelled from far and wide to receive their Certificates of Commendation for taking part in the special joint project from the Chairman of Glasnevin Trust, John Green, and the Chief Executive George McCullough. Never Such Innocence Founder and CEO Lady Lucy French spoke at the event and was honoured to also visit the grave of her own Great Aunt, Charlotte Despard, who is buried in the cemetery. The extended Island of Ireland bonus competition culminated in the creation of a special booklet, to commemorate all those from the Island who lost their lives or were affected by the First World War. This booklet contained the top entries from the Republic of Ireland and Northern Ireland for each age category as selected by our panel of judges, and was presented to several VIPs on Armistice Day at Glasnevin. We were delighted to present a copy of this booklet to all attendees on the 13th December. On the day, everyone had the opportunity to look around the museum and view the brilliant exhibitions on offer. We then began proceedings with the striking backdrop of the cemetery visible through the window, as a reminder of the reason for our commemoration. John Green, Chairman of Glasnevin Trust, spoke about the First World War in Ireland and the tragic loss of life and division that it entailed. Throughout the event, children and young people shared the incredible work that they had produced in response to learning about this conflict. Some of the brilliant poetry and artwork that was showcased at the event can be viewed here. Every young person at the event received a personalised Certificate of Commendation, a well-deserved reward for their brilliant creative work to mark the centenary of the First World War. songs that expressed their reflections on the First World War, and on conflict more widely. We would like to say a huge thank you to the Glasnevin Trust for kindly hosting the event and for partnering with us on the extension of the competition, and to the schools and young people who took part in the competition and attended the event! In September 2019 Never Such Innocence will be launching a new project, Giving Children and Young People a Voice on War. Building on our four years of commemorating the First World War, this new phase of the project will give children and young people an opportunity to process, respond to and reflect on war and conflict throughout the ages including violence of all forms today. We will invite young people to create a poem, song or piece of art reflecting on something they feel strongly about within their local community, or wider society. If you would like to be involved please do let us know by emailing enquiries@neversuchinnocence.com, or signing up to our education newsletter. We were incredibly proud of Jasleen and Becki, two Never Such Innocence poetry competition winners who were selected by the Department for Culture to take part in the Service of Thanksgiving at Westminster Abbey on Sunday 11th November 2018. The two winners were asked to read a prayer during the Service, in the presence of Her Majesty The Queen and His Excellency Frank-Walter Steinmeier, President of The Federal Republic of Germany. Here is Jasleen’s account of the experience…. Earlier this year, I was lucky enough to attend the Never Such Innocence Awards Ceremony in the Guards’ Chapel, Wellington Barracks, as my poem won first place in the age 11-14 poetry category. Following this fantastic event, Never Such Innocence emailed all the winners from the four years the competition has been running and invited us to the NSI Centenary Finale at Buckingham Palace. This was a fantastic and truly memorable experience. It was my first time inside the Palace and it is such a stunning building. As I had been asked to read my poem at the Ceremony, I arrived a few hours before the event was due to start. Upon arrival we were directed to the South Drawing Room, where all the winners who were performing were able to practice and take in the amazing views from the windows. The event itself was held in the magnificent Ballroom, it was ornately decorated with red, white and gold. After the performers had a rehearsal, the guests began to arrive as the RAF Salon Orchestra played the theme tunes from many popular films. We were also treated to the Marine Drum Corps and the band of the Scots Guards as part of the celebration. It was a fantastic experience to be able to read my poem in front of all the past winners and dignitaries. The whole event had such a memorable atmosphere and it was inspiring to see the contributions of young people through poetry, art and song to remembering the centenary of World War One. A huge thank you must go to Never Such Innocence for organising the event and making sure it ran smoothly and was the enjoyable event it was. On Sunday 11th November I was privileged enough to read a prayer at the National Service of Thanksgiving to mark the Centenary of the Armistice at Westminster Abbey. This was because Never Such innocence passed my name on to the Department for Digital, Culture, Media, and Sport as someone who had made a significant contribution to the Centenary of World War One. This meant attending a rehearsal on Saturday 10th where we had a run through of our parts for the Service. We were also able to explore the Abbey which is incredibly rich in history. We were able to see the graves of many famous people such as Charles Darwin and Isaac Newton. We also saw the fresh flowers being carefully arranged around the grave of the Unknown Soldier in preparation for the Queen and the German President to lay wreaths there to mark the centenary. It was amazing to see the architecture, the stained glass windows and the elaborate memorials to famous figures throughout history. I was also able to have a practice interview with the BBC about my personal connection to World War One. My poem titled 'The Indian Soldier' was inspired by my family history. 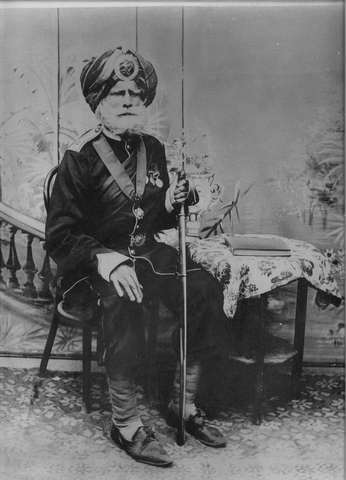 My great great great grandfather Lehna Singh was a highly decorated soldier, as was his son Labh Singh and then it was his son Jagat Singh who fought in the First World War when he was just 17 years old and survived. The BBC wanted to capture my personal connection so I was interviewed about this, and the interview was aired as part of the ceremony on BBC One. I am incredibly proud of my family heritage and it was such an amazing experience to be able to share this on live TV. It was also fantastic to see behind the scenes of how they film the service and all the technology involved in capturing the ceremony. The ceremony itself was so special and it had such a deep feeling of remembrance. The service featured readings from the Dean of Westminster Abbey as well as Theresa May, Prince Charles and the President of the Federal Republic of Germany, Frank-Walter Steinmeier. It was amazing to see the Royal Family and other important Members of Parliament. It was such an incredible experience as we were sitting only a few rows from the front so we had a perfect view of the podium where the readings were given. When it was my turn to read, it was a truly exhilarating moment. I could see the Queen was only about 10 feet away from me and I could see the Royals as well as the Prime Minister and other Members of Parliament. I took in that moment and read my prayer with conviction that I hope did justice to all the brave soldiers we were gathered to remember. We then read the Lord's Prayer together and the Prayer readers exited. I couldn't quite comprehend what I had done until I watched the Service back afterwards and I saw myself on TV and it was really interesting to see what I looked like to the millions of people watching at home. The prayer readers then sat down while a hymn was being sung. At the end we all sang 'God Save The Queen' while Her Majesty exited followed by other members of the Royal Family. After the ceremony, I received many congratulations from audience members which was lovely. We then were able to take in the beauty of the Abbey again as we made our way outside. It was beautiful to see the Abbey lit from the outside and take in the beautiful ambience of London on our way back. I am honoured to have been given the opportunity to take part in such an historic event. Jasleen’s poem ‘The Indian Soldier’, along with all of the winning poems and artwork from the 2017-18 competition, can be viewed here. Lossie High goes to Buckingham Palace! On Wednesday 7th November we were lucky to have the amazing experience of performing in Buckingham Palace, it was the most incredible day which we will never forget. This all came about because in January 2018 a songwriter –Marty Longstaff from The Lake Poets - came into our S3 music class to give us a workshop on how to write a song. We looked at how to write lyrics, how to write a catchy chorus, and experimented with chords and harmonies. Marty came from the charity Never Such Innocence, who aim to give every child a voice on the centenary of the First World War. As we come from Lossiemouth we chose to theme our song on the RAF, particularly as it is the year of RAF100. We thought about how pilots would jet off into the skies, knowing they might not land back to earth. We also thought about the families back in Lossiemouth, who were just the same as they are today. The whole song-writing experience was eye-opening for many reasons and many of us are continuing to write songs now. In March we entered the song into the Never Such Innocence Songs of the Centenary competition and we were amazed to find out a few weeks later that we had been chosen as winners of the age 11-14 category! Winning the competition came as a surprise. We knew it was an international competition so our hopes weren’t very high, so when Miss Mulford told us that we had won we were shocked and so excited. To collect our award we flew down to London and performed at The Guards’ Chapel, Wellington Barracks. This experience was amazing as many of us hadn’t been to London before and none of us had performed in a venue like the Guards Chapel. It was a fantastic day which featured us witnessing a parade by the Royal Marines Drum Corps, getting to meet the heads of the military and also Chelsea Pensioners. We were also featured on BBC Radio Scotland, answering questions about our experience and hearing the song played out to thousands of listeners. One of the most exciting parts of writing the song was getting to record both the audio and the music video. In April we went down to Lossie beach with Mrs Shearer and Miss Mulford and we sang the song in lots of different areas of the beach. Mrs Shearer then put all this footage together with our song and made a fantastic video which has been used by RAF Lossiemouth as part of their RAF100 commemorations. In October we also went to Gordonstoun to use their recording facilities. A sound engineer from Inverness recorded us singing the song about twenty times, but it was worth it as the recording now sounds great. Recording the song was a great experience as we learned about what a sound engineer does and how recordings are made. We thought this would be the end of our experience, but the icing on the cake was certainly being asked to perform in Buckingham Palace. We knew we had to go and make the most of this incredible opportunity that not many people in their lifetime get to do. We left Lossiemouth at 3.45am and were inside the Palace by 11am. We weren’t allowed to take photographs inside the palace, but it was the most incredible building we had ever been to. Every room was huge with intricate decoration and lots of chandeliers. The main event took place in the Ballroom where the Queen holds her knighting ceremonies. The afternoon included lots of songs, poetry readings, and addresses from Lady Lucy French and Sir Tim Laurence – Princess Anne’s husband. After the ceremony we had a delicious afternoon tea and we were able to wander freely around the drawing rooms, throne room and the music room. Our favourite was the White Drawing Room, everything was made of gold and we were able to sit in the chairs! There was a wall size mirror which we found out was actually a secret door for the Queen to enter in without her guests noticing. It was a shame that we didn’t get to meet or see the Queen, but it was still such an honour to be there. To end the whole event we sang our song in the Music Room. We were accompanied by the RAF Salon Orchestra and they made our song sound truly magical. Singing in Buckingham Palace was an experience like no other and we will remember it forever. A big thankyou to Miss Mulford who has made all of this possible by entering us into the competition and helping us write the song. Thank you to Ms Scott, Mr Carthew and Mrs Simpson who have made these incredible trips possible. We’d also like to thank Moray Council, Never Such Innocence, RAF Lossiemouth, and all the other contributors who have supported and funded our experiences. by Alex Aylott, Meriel Boyd, Connie Duncan, Milly Mackay, Iona McDowall, Grace Newlands, Kimberley Orr, Craig Rae, Chloe Scott, Marcello Seivwright, Connor Small, Claire Taylor, Emma Whyte and Charlotte Wright. All pupils listed here have taken part in the song in different ways. As we approach the centenary of the Armistice on 11th November 2018, we are so proud of NSI children and young people who are playing their part in marking this important day. Wednesday 7th November: NSI Centenary Finale, Buckingham Palace - by kind permission of Vice Admiral Sir Tim Laurence, all First, Second, and Third Place Winners from the four annual centenary competitions are welcomed to a Tea Party at Buckingham Palace to mark four years of children and young people playing their part. Wednesday 7th November: Publication of Centenary Legacy Books - the Never Such Innocence Anthology and Stories of the First World War are officially published! Thursday 8th November: Games of Remembrance, Nottingham - Children from Germany who have taken part in Together attend the Games and act as mascots and flag bearers! Children from Greece also join them on the pitch and to watch the two matches between the British Army and the German Armed Forces football teams! Friday 9th November: Langley Vale Centenary Wood (Surrey) - 2016/17 winner Rebecca Farnfield reads her incredible poem inspired by a tree watching over the War I Stand Alone (p.88 of NSI Anthology). Sunday 11th November: Service of Thanksgiving, Westminster Abbey - 2017/18 poetry winners Jasleen Singh and Becki Pinkerton read prayers as part of the Service. Together winning poem Carpe Diem features in the Order of Service. Children and young people from all four years of the competition also attend the Service in recognition of their contribution to the centenary commemorations. Sunday 11th November: All Saints Church, Odiham - after hearing Lydia Grigg’s incredible song Remember (available as part of the Songs of the Centenary album! ), RAF Odiham have invited her to sing on Remembrance Day at their local Church. Sunday 11th November: Belfast Cathedral - 2017-18 poetry entrant Hannah is invited to attend the Remembrance Day Service in recognition of her work to commemorate the Centenary. Sunday 11th November: Glasnevin Cemetery - a special commemorative booklet of winning work of the Island of Ireland extension of the competition is distributed to attendees. Sunday 11th November: Llandaff Cathedral - poetry winner Mari reads her poem "Yr Enaid Byw" / “My Living Soul” (p.125 of the Never Such Innocence Anthology) as part of the service. Sunday 11th November: Queen Elizabeth Olympic Park - Lili Fairclough, 2017-18 Runner Up for ages 11-14 from local school Mossbourne Victoria Park Academy, reads her moving poem We Shot the Dreamers (p.150 of the Never Such Innocence Anthology). Tuesday 13th November: Brackfield Centenary Wood (near Derry / Londonderry) - Two Never Such Innocence poets, from County Dublin (ROI) and County Antrim (NI), take part in a commemoration of all those across the Island of Ireland who lost their lives in the First World War. Thursday 15th November: Together Awards Ceremony, British Embassy in Berlin - Children from the UK and Germany receive their prizes for winning Together: A UK-German Centenary Project at the British Embassy, hosted by the British Ambassador to Germany. We are so proud of all of the winners! We were delighted to have two Never Such Innocence entrants take part in a special commemorative event at Carrickfergus Town Hall, Northern Ireland. A specially adapted Tall Ship, STS Lord Nelson, crewed by veterans and cadets, is making its way around the United Kingdom in 40 days. The ship is sailing with a crew of 144 cadets alongside wounded, injured and sick veterans with the 145th crew member being a Tommy silhouette kindly donated by the charity There But Not There, around the capitals of the United Kingdom. Matthew Heaney and Becki Pinkerton joined members of the crew at Carrickfergus Town Hall to mark the centenary by reading their poems. Matthew won Second Place in the ages 9-11 category, and Becki came Third in the ages 14-16 category of the 2017-18 competition. We were delighted to have two Never Such Innocence entrants take part in a special commemorative event at the Scottish National War Memorial, Edinburgh Castle. Megan Adams and Nathan McGinlay joined members of the crew at the Scottish National War Memorial to mark the centenary. Megan sang her incredible song Before You Think, and Nathan read his poem 'We Will Remember Them', beautifully. Waiting for their inevitable death. They lay there, fates sealed by the gun. And hundreds and hundreds of brave men were killed. Who in the war played important roles. Every year we hold a minute’s silence. First Place winner of the 'War in the Skies' strand of the poetry competition for years 7-9 Freiya has written about her incredible experience as a prize winner! Never Such Innocence was founded by Lady Lucy French in March 2014 to enable young people to play their part in the centenary of the Great War through learning, poetry art and music with annual international competitions. The RAF 100 ‘War in the Skies’ strand of Never Such Innocence was a poetry and art competition to mark the 100 Year Anniversary of The Royal Air Force. In May 2018 I won the age 11 -14 category, beating 6700 applicants with my poem ‘The Sopwith Camel’. Here is my story. It was a Monday after I had finished my last lesson at School I found out I had won. Dr Jones had been waiting outside my Latin classroom to speak with me. Nervously, I walked towards her, thinking I was in trouble for something. I was then told that I had won the international RAF 100 War in the Skies competition. Running down the corridor, I went to go to my mum’s office to tell her that I had won the competition for my poem, which I hadn’t actually let her read properly at that point. The first thing I had to do was attend Wellington Barracks and read my poem in the Guard’s Chapel, in front of other winners and a lot of dignitaries. On Thursday 24 May I arrived at the barracks. I had the opportunity to look round the Guard’s Museum, where I had a personal tour from a retired guard who was very passionate about his time serving the Queen. The museum had lots of uniforms from all the ages, and even the uniform that the Queen wore riding her horse, for one of her father’s ceremonies. It was an amazing day with the RAF marching with their band, watching the rehearsal of the Trooping the Colour and the Drummers performing for us. At the chapel, I was awarded my prize by General Sir Gordon Messenger. On Saturday 7 July my family and I attended Horse Guards Parade and I was given a personal tour of the RAF aircraft display and a ‘Spitfire Cockpit Experience’. I sat in the cockpit of a Spitfire and also the new stealth jet ‘Lightning’. The Chinook we all sat in was fascinating as it can carry people, vehicles and equipment. It is also capable of transporting vehicles and containers underneath the aircraft by straps. On Tuesday 10 July the RAF held the centrepiece of their celebrations – 100 aircraft flypast over Buckingham Palace. I was one of a few non-RAF personnel who were able to fly in the RAF aircraft ‘Voyager’ whilst it participated in the flypast. I attended Brize Norton which is an active RAF base and I saw lots of different RAF aircraft. The airplane experience was exciting, and we got to see a few of the main attractions in London, such as the Olympic stadium and Tower Bridge from the airplane. At one point, we were going at 400 miles per hour. We had to wait for quite a long time in a holding point. A holding point is when you keep on circling the same area, and we did this because we had to wait for all the other airplanes to join us. Our holding point was over the sea. Just before 13:00, we started heading towards land (and London). We then flew over Buckingham Palace, and we returned back to Brize Norton, to disembark. My sister watched us on the television and recorded our flypast! I have been made aware there may be another event to attend in November for the Never Such Innocence winners. I am sure that whatever it is, it will be an amazing experience. Thank you Never Such Innocence and RAF 100. Freiya's winning poem 'The Sopwith Camel' and the rest of the RAF100 winning work, can be viewed here. Our visit to Warminster Garrison in Wiltshire was a brilliant day for us and for all involved. We are incredibly grateful to Dr Andrew Murrison MP for being our prizegiver, and to Colonel Brooking, Major Andy Cooper and all at the Garrison for hosting us so kindly. We were also delighted to be joined by the Mayor of Warminster Councillor Tony Nicklin, and the Mayoress of Warminster. It was brilliant to be at Warminster Garrison, a longstanding, thriving military community where over 1500 service personnel are based. It is currently home to the Land Warfare Centre and several specialist training schools. We were in Wiltshire to hand-deliver some special Certificates of Commendation to local children and young people who have worked very hard indeed on poetry, art, and songs commemorating the First World War. We were lucky enough to meet students from Bellefield Primary School, St Johns CE Primary School, Holbrook Primary School, The Mead Community Primary School, and The Springfields Academy. We were warmly welcomed by Colonel Johnny Brooking, Garrison Commander. Colonel Brooking spoke about the value of commemoration to those in the Armed Forces today, and thanked the children and young people for their hard work. First to receive their certificates were The Mead Community Primary School, who performed their amazing song. The group had help in creating the song from a local conductor and musician Grenville Jones, and sang beautifully about the optimism that so many troops felt that “It will all be over by Christmas!”, followed by the hardships of war. The event had an abundance of music, as two of the other schools had also been working with Never Such Innocence Artist in Residence Bethzienna Williams in free songwriting workshops to create entries on the themes of unity and hope for the future, for Together: a UK-German Centenary Project. St. John’s CE Primary now performed their creation, called ‘La La Land’. The mixed group of year 6 and year 2 worked well together to write the song and then performed it beautifully. We were then able to listen to a moving poem by a student from Holbrook Primary School about leaving family and friends to fight in the First World War, and two students from Holbrook then received their certificates from Dr Murrison. It was so lovely to have the whole class present to support the two entrants! After being extremely impressed by songs and poems we awarded certificates to students from Springfields Academy for their artwork. All three of the students had shown remarkable creativity and their artwork was displayed as they received their certificates from Dr Murrison. Everyone from Bellefield sang incredibly well, and then received their well-deserved certificates from Dr Murrison. After the performances we were treated to some brilliant activities; a ‘First World War Officer’ was stationed in one room and very kindly explained his equipment, uniform, and weapons to everyone, and we had the opportunity to look at two ‘Warrior’ armoured fighting vehicles. First used in 1916, tanks have come a long way since the First World War and seeing two modern examples was very interesting and of course exciting! It was absolutely brilliant to meet so many local students from different schools, and to witness in person the incredible creativity and hard work that everyone had put into their entries. We can't wait to see what else the children and young people of Wiltshire have to offer! For more information about our work or to get involved, please get in touch via enquiries@neversuchinnocence.com or 0207 836 2603. We were absolutely delighted to board the last surviving ship of the Battle of Jutland, HMS Caroline, on Thursday 12th June with local children and young people. We received hundreds of entries from Belfast and across Northern Ireland to the 2017-18 poetry, art, and song competition so it was wonderful to have so many students attend this special event to receive their Certificates of Commendation in person. Before the event everyone had the opportunity to look around the museum and learn about the ship’s First World War history. Mrs Michele Marken DL very kindly joined us to represent the Belfast Lieutenancy and award the certificates. Former English teacher and Headteacher Mrs Marken spoke beautifully to the students about how wonderful it is to see so many children and young people writing poetry and creating artwork as a response to the centenary of the First World War. We were extremely proud to be joined at HMS Caroline by former First Place poetry competition winner Maeve Loney, who read her wonderful poem No Poppies in the Sand. Maeve’s poem is about the Imperial Camel Corps and was inspired by a painting featured in the Fourth Edition educational resource, The Long Patrol by James McBey. Maeve won the competition in 2015-16 while she attended St Patrick’s College Ballymena. The 2017-18 competition also saw two winning poems from Northern Ireland, and both winners joined us at HMS Caroline to read their poems. Matthew Heaney from Lough View Integrated Primary and Becki Pinkerton from The Royal School Armagh both read their wonderful poems, demonstrating great confidence and maturity. Matthew and Becki’s poems along with the rest of the winning work, can be viewed here. Students from Carrickfergus College attended as representatives of more than 100 students from the school who took part. These entries were inspired by the Royal British Legion Thank You Movement and submitted as part of the 2017 Thank You Competition. The 2018 competition is now open for entries, more information can be found here. Mrs Michele Marken DL also awarded certificates to students from Strathearn School, Sullivan Upper School, and Victoria College Belfast. Every student present received their personalised certificate from the Deputy Lieutenant, and teachers from each school also accepted certificates on behalf of the whole school. Some students from Sullivan Upper School and Victoria College Belfast, took part Together: a UK German Centenary Project. More information about this project is available here. We would like to say a huge Thank-You to the team at HMS Caroline who made the event so special, to Mrs Michele Marken DL, and most importantly to the fantastic children and young people who we were privileged to work with. Never Such Innocence roadshow at the Ulster Museum a big success. We were privileged to visit the Ulster Museum on Thursday 19th October as part of our roadshow events programme. We were lucky enough to be there at the same time as the ‘Weeping Window’ sculpture, which has been touring major buildings since its launch at the Tower of London.